← Who’s Crazier? Tiny Tim or Al Gore? It’s amazing how the “warmer” press and blogs latch on to silliness. They’ll hop on anything about global warming faster than the Lone Ranger jumps on his horse “Silver.” I did a Google search on “Africa’s Lake Tanganyika, Warming Fast Life Dying” the result shows as of now there are 66,600 search results on this headline and it hasn’t even been up but about 3 days. If it sounds like doom and gloom and it’s blamed upon global warming it really gets out there fast. What it really amounts to appears to be much ado about nothing, which is business as usual with the “warmer” crowd. This is what happens when you send people from liberal Brown University, who conveniently come up with another scare-a-rama about global warming, in what appears to be another feeble “alarmist” attempt to counter climategate and all the other “gates” since. I originally found this article from Reuters about how Lake Tanganyika has warmed while perusing things on the net. Africa’s lake Tanganyika has heated up sharply over the past 90 years and is now warmer than at any time for at least 1,500 years, a scientific paper said on Sunday, adding that fish and wildlife are threatened. Of course we have to tie this in with global warming and CO2. Lead scientist on the project Jessica Tierney told Reuters the sharp rise in temperature coincided with rises in human emissions of greenhouse gases seen in the past century, so the study added to evidence that emissions are warming the planet. And of course we have to use the warmista’s favorite word “unprecedented.” “Coincided” seems odd, too, like they’re saying it could be mere coincidence, but it’s got to be caused by CO2 because it goes along with the CO2 Insanity agenda. The paper argues that recent rises in temperature are correlated with a loss of biological productivity in the lake, suggesting higher temperatures may be killing life. “Lake Tanganyika has become warmer, increasingly stratified and less productive over the past 90 years,” the paper says. See, they use words like “suggesting” and even use “unprecedented” twice. Note they link it to “human” (anthropogenic) global warming, too. That’s a mighty big conclusion in my humble opinion, not to mention mighty convenient. So how much is this “unprecedented” temperature rise? The rise in temperature over the past 90 years was about 0.9 degrees Celsius and was accompanied by a drop in algae volumes. Note, I’m not questioning the temperature rise, or the algae drop, but I do question what’s causing it and if it’s “unprecedented” or not. I find the next line interesting as it makes it obvious they don’t really know what’s causing it. But the paper admits that other factors, like overfishing, may be doing more harm than any warming. Yes, “overfishing” could be an excellent reason there’s less fish. Perhaps not the whole reason, but certainly a large factor, especially when you see the below on the population increase in the region over the previous 90 years, which explains why overfishing would be one of my top choices on why there are less fish. Another factor would be the resulting pollution from the dramatic increase in population of the region. This would lend itself handily in explaining problems with the lake. The reality is that what they’re actually saying is that they don’t know what the cause is. I have to wonder if this was even peer-reviewed? To start laying things out and get somewhat of a handle on what was gong on in Africa 90 years ago (1920), I find the following about population. This is certainly not exact science, but I think it provides a good idea of what the population increase in this region has been since 1920. It’s dramatic enough that it should not be necessary to be splitting hairs over what the real increase was. A few million people plus or minus wouldn’t make much of a difference considering the magnitude. The country “Tanganyika” (a country in 1919), comprised of what is known today as Tanzania, Rwanda and Burundi, had a population of 3,500,000 in 1919, per this website. If you want a better idea of the population explosion in the region around Lake Tanganyika, the original “Tanganyika” was comprised of only part of the countries surrounding Lake Tanganyika. In addition you have to add the Congo, Malawi and Zambia. For the sake of argument, lets say those additional three countries add another 3,500,000 people and make it an estimated total in 1919 of 7,00,000 people in the region surrounding Lake Tanganyika. Total populations today, per the World Bank (as of 2008) are, Congo: 6,425,635, Tanzania: 42,483,923, Malawi: 14,846,182, Zambia: 12,620,219, Burundi: 8,074,254. The total is: 84,450,213, roughly 77,450,000 more people in the region surrounding Lake Tanganyika in the past 90 years. Now you can see the magnitude I referred to. While not all this population lives immediately adjacent to the lake, I’d be willing to bet the increase in population around the lake was probably at least proportionate to the population increase in the entire region. Please don’t tell me this is not going to be a gigantic factor regarding the quantity of fish in this lake. I’m sure you can easily imagine the increased fishing and the increased pollution resulting from an additional 77.5 million or so people in the region. I read one item noting that the water in Lake Tanganyika is no longer potable, which is another indication of problems not caused by CO2 over the past 90 years. Problems no doubt caused by pollution from runoff of things like fertilizers, animal waste, human waste, sewage, and the dumping of chemicals that could also be causing fish decline. To go back to the “unprecedented” warming. I can’t find anything on Lake Tanganyika, but I did find this from NOAA about the surface temperatures in Lake Malawi, which is in the same region of Africa, just South of Lake Tanganyika. SUGGESTED DATA CITATION: Powers, L.A., et al..  2005. J.S. Sinninghe Damsté, and S. Schouten. 2005. Geophysical Research Letters, 32, L08706, doi:10.1029/2004GL022014. to deglaciation and to varying conditions during the Holocene. and a European Association of Organic Geochemists travel scholarship to LAP. TEX86 paleothermometer. (TetraEther indeX of tetraethers with 86 carbon atoms). data sets on this website. LST=(TEX86-0.25)/0.017 with a calibration error of +/- 2 degrees C.
Lake Malawi core M98-1P: 10º15.9'S, 34º19.1'E, water depth 403m. Lake Malawi core M98-2P:  9º58.6'S, 34º13.8'E, water depth 363m. As noted above they had a 3.5 degree Celsius warming since the last glacial maximum approximately 20-21,000 years ago. Then they had a 2 degree Celsius temperature reversal during the Younger Dryas (12,900-11,500 years ago). I find it amusing that they’re referring to a .9 degree Celsius warming as being “unprecedented” considering that by comparison, there are larger temperature swings than noted in the study by the Brown University group. You can also see that coming off the last glacial maximum, the lake warmed, as did the rest of the Earth, then when the temperature dropped during the Younger Dryas, so did the temperature of the lake. Also, the Little Ice Age ended about 1850 and we’ve been warming again. Is it really “unprecedented” the lake is also warming up again? It seems there is a non-CO2 caused pattern that’s merely repeating itself again. Since they’re claiming CO2 is the cause, here are some CO2 levels for you to ponder. You can see from the below chart that around the last glacial maximum 20,000 years ago CO2 was under 200 ppm. (CO2 is the round dots-middle line). Note the CO2 level stays relatively flat with a little rise until about 17,00o years ago, then starts rising at a faster pace. 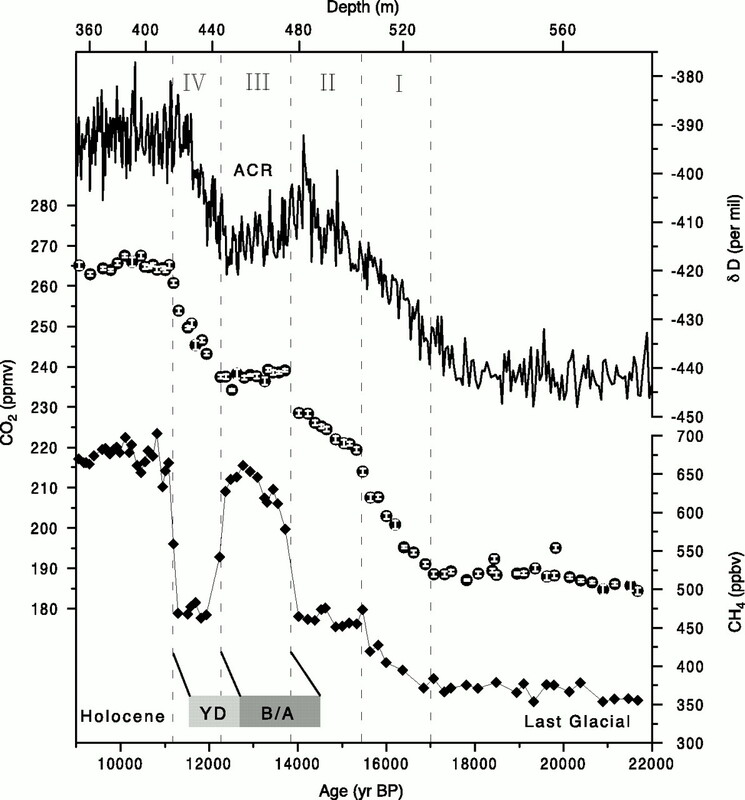 Now look at 12,900 years ago (Younger Dryas). Notice the CO2 level is now about 240 ppm yet the temperature is dropping? Then notice it continues to rise while the temperature is still dropping until 11,500 years ago? (For temperatures during the same periods refer to the second chart. Sorry I didn’t come across one with both). To me it shows there’s no direct correlation between CO2 levels and temperature changes. You want more to consider? This study from Science Online from 2008 titled “Northern Hemisphere Controls on Tropical Southeast African Climate During the Past 60,000 Years” also leaves me wondering about the anthropogenic global warming claim and also seems to back up my thought that CO2 is not driving this. The processes that control climate in the tropics are poorly understood. We applied compound-specific hydrogen isotopes ( D) and the TEX86 (tetraether index of 86 carbon atoms) temperature proxy to sediment cores from Lake Tanganyika to independently reconstruct precipitation and temperature variations during the past 60,000 years. TTanganyika temperatures follow Northern Hemisphere insolation and indicate that warming in tropical southeast Africa during the last glacial termination began to increase 3000 years before atmospheric carbon dioxide concentrations. Note they show warming FOLLOWS Northern Hemisphere insolation, and INCREASED 3,000 years BEFORE CO2 increased. More doubt about CO2 causing this regardless if the source is natural or anthropogenic. They also note the temperature fluctuations in the lake over the past 60,000 years, again perhaps this .9 Celsius warming isn’t all that unusual or man caused. Our TEX86 and Dleaf wax reconstructions show that temperature and hydrology in the Tanganyika basin were extremely variable throughout the past 60,000 years (Fig. 2). Holocene lake surface temperature (LST) fluctuated between 27° and 29°C, whereas temperatures during the LGM were 4°C cooler. The magnitude and timing of this temperature shift are similar to those of nearby Lake Malawi (14), indicating that our TEX86 record captures regional temperature change in tropical southeast Africa during deglaciation. Again, more fluctuation than .9 degrees Celsius. They then proceed to state the surface temperature changes in these lakes are not CO2 related! In particular, Tanganyika LST at the end of the LGM follows rising Northern Hemisphere summer insolation, a potential trigger for deglaciation (20). Temperatures rise at 20,000 ± 380 yr B.P., just as they do in a TEX86 LST record from Lake Malawi (14) (Fig. 3). This timing is consistent with rising temperatures at 20,000 yr B.P. in Antarctica, yet leads the deglacial CO2 rise recorded in Antarctic ice cores (21) by about 3,000 years, a difference that is outside the chronological errors of the ice core and the LST records. Increasing greenhouse gas concentrations are therefore not responsible for the initial transmission of warming from the high latitudes to the southeast African tropics. “Not responsible.” I don’ t know how you can get clearer than that. More CO2 Insanity. Will it ever end?